Two Rangers supporters have been jailed for two years each for attacking Celtic coach Neil Lennon hours after an Old Firm game. A jury at Glasgow Sheriff Court found David Whitelaw, 47, and 43-year-old Jeffrey Carrigan guilty of assault. However, the pair were cleared of an allegation that the attack on 1 September last year was aggravated by religious prejudice. Sheriff Martin Jones said the attack was "vicious, brutal and cowardly". He added: "After being punched to the ground and lying defenceless, you repeatedly kicked the complainer about the head and body and at some point he was rendered unconscious. "You showed no concern for your victim and and no appreciation of the consequences of your actions. "The complainer was indeed fortunate that he didn't receive more serious injuries." 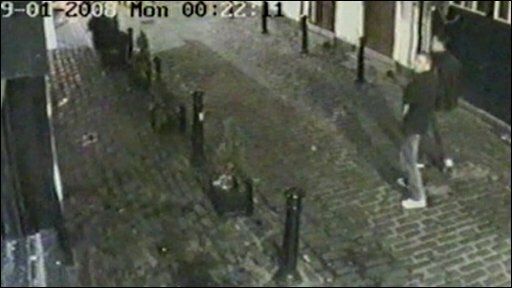 The attack took place in Ashton Lane in Glasgow's west end, hours after Rangers defeated Celtic 4-2 in the opening Old Firm game of the season. Carrigan and Whitelaw, both from Knightswood in Glasgow, had told the court that they were Rangers fans.The trial heard that Carrigan had asked Lennon: "Did you like the score today?" 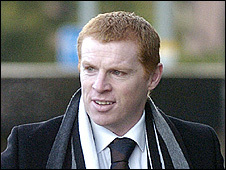 A witness said that in reply, Lennon raised his middle finger at the men. The pair had claimed that Lennon started the fight by pushing Carrigan and grabbing him by the throat, but witnesses said Whitelaw threw the first punch. One witness said Whitelaw had been wearing a chain with a distinctive Rangers FC crest. Lennon, who suffered cuts above his eye and lip, told the court that he could not remember anything about the attack. He said: "A friend of mine offered to walk me up the road but I said I would be fine as I only live three minutes away. "The next thing I remember I was lying on the ground and somebody was dabbing my face asking if I was okay. "My next recollection is waking up in hospital with my fiancee sitting at the end of the bed crying and my manager looking pretty concerned." After the pair were convicted, the court heard that Whitelaw had 16 previous convictions and was jailed for six years in 1993 for drug offences. Carrigan, who had eight previous convictions, was jailed for five years in 2003 for drug dealing.